It might just be a simple, colorful infographic, but it is a pretty nifty little visualization that does present an interesting discussion regarding poster designs. We tend to feature a lot of posters here on FS.net, good and bad, but that's because we love looking at all the colorful artwork that designers come up with. There's a visualization going around the web, boosted by Gizmodo, of a visualization by Vijay Pandurangan on his own blog that shows a 1914 to 2012 evolution of the color of movie posters. He organized each year by hue, lined them up and shrunk it down to viewable size and now it looks quite… pretty. But also very intriguing. Vijay explains how he made the image: "I first made a unified view of colour trends in movie posters since 1914. Ignoring black and white colours, I generated a horizontal strip of hues in HSL. The width of each hue represents the amount of that hue across all images for that year, and the saturation and lighting were the weighted average for all matching pixels. Since HSL has a fixed order, comparisons can be made between years visually." He also made a version without "lightness and saturation", which has smoother colors. Note the increase in bluer & blacker posters as time goes on, plus how quickly pink went away. This graph ties in with those top trends and the orange/blue comparisons. Always interesting to visualize Hollywood trends. 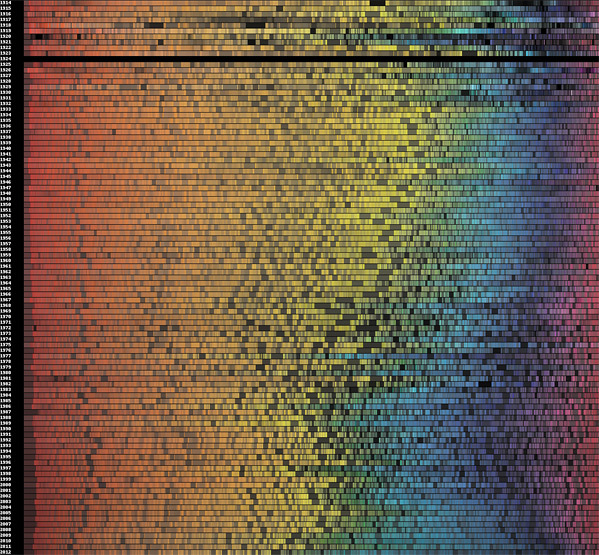 It's a graph with each year in movie history on each horizontal line, and the posters from each year (the general color of each poster) organized by the color/hue. Just to give a general idea of the overall color/look of movie posters throughout these 98 years. Just an interesting visualization of data. As you can see the blue posters grew significantly after 2009. Gee, I wonder what movie with blue characters came out that year and made a shitload of money..
Weird. I actually thought it would have been a lot darker, I seem to remember so many movie posters having black backgrounds as a teenager. Maybe they were all straight to video.